This article is about the iRobot Roomba, a small, round, wonderful robotic vacuum cleaner that doesn't require you to push it, unless it gets stuck. I have an iRobot Roomba; I bought it May 2010, which means as of this writing, I've had it almost two years. I knew about the Roomba for 7 years before buying one. I wanted one years ago, but I wanted to wait until some of the bugs were worked out. I have the pet model 562 and days after buying Roomba, I bought the aerovac bin for it. I am so happy that I have this little robot vacuum cleaner and I will tell you that Roomba has some limitations. I will tell you about those and what I have learned about using the Roomba. About the pet models - Regarding the difference between 560 and pet model 562 -- 562 comes with an extra set of brushes and the flat brush cleaning tool. The newer pet model, 564 comes with the aerovac bin and a virtual halo. The virtual halo should be placed with your pet's food and water bowls to keep roomba from bumping into them. Some earlier models (earlier than 560) do not offer the scheduling feature. Mine does and it works very well. With the scheduling feature I can set Roomba to start running at any time during any day of the week, once a day for any or all of the days. That is a long way to say that I can set it to run at 7:15 AM on Monday, to skip Tuesday, and set it to run at 9 AM on Wednesday [.etc.]. When it is time for Roomba to run, it backs off of the charger making a back-up beeping sound as it moves backward and then it swivels around 180 degrees and starts vacuuming. The scheduling feature is wonderful even if you have to inspect the floors before Roomba runs. These are some things to look for before running Roomba. The items mentioned in the list below are the most common things at my house that makes Roomba hang up or is potentially bad for Roomba. If you get a Roomba, your list of things might be similar or different. Roomba can get hung up on shoestrings and thin cords. Thin cords such as headphone cords and thin recharger cords will wrap around Roomba's side brush. Thick cords such as the kind on a surge protector can hang up Roomba if it climbs over the cord. Roomba could free itself, but then again, it might not. The handles that are on plastic grocery bags will hang up Roomba. The bag handles will wrap around Roomba's side brush. Roomba should not run over anything wet or anything that comes out of a pet from either end (sorry about mentioning that). Roomba works best on hard floors and low nap carpet. I'm not saying that it does not work on loosely napped taller carpets, it just does not work as well as a regular vacuum cleaner. Most of the time, I use Roomba on my hard floors, about half of my house consists of hard floors, tile and wood. If I compared Roomba to a broom, Roomba would win every time; Roomba is leagues ahead of the broom. Just having Roomba "sweep up" for me everyday in my kitchen, dining room, and laundry room is a time saver, even with Roomba's maintenance. It's true, Roomba needs care. I empty Roomba's dust bin either every use or every other use. Every 3 months, I change its filter. Roomba also requires that its brushes are cleaned and that must be done every 2nd, 3rd, or 4th use. The brush cleaning really depends on how many long-haired people live in your house and how many furry animals you have. The front wheel must be popped out and cleaned and the side brush must be unscrewed (Phillips screwdriver) and cleaned. Doing all of the brush and wheel cleaning takes about 10 minutes or less, it usually takes 5. The Roomba comes with a brush cleaning tool that works well. Always remember that a robot vacuum cleaner is like a Millennium Falcon while a regular vacuum cleaner is like an Imperial Cruiser. My Roomba stopped picking up one day not too long ago. It would run a little while, making a thumping noise, not picking up anything and shortly after that it would stop running. It told me that its brushes needed cleaning, but the brushes were clean. There is a Roomba forum online that is extremely helpful and I visited it. 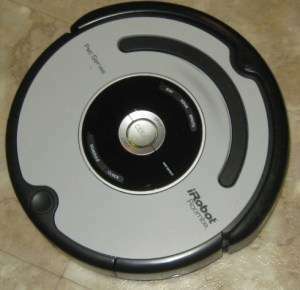 [ http://www.robotreviews.com/chat/ ] I discovered there that I was supposed to have been cleaning Roomba's gear box every few months and I had not cleaned it once in all of this time. The thumping was a symptom. The brushes not moving was the other symptom. I checked my brushes and they did not spin. Instructions for cleaning the gearbox were at the forum, complete with photographs. It was not hard to open the Roomba and clean the gears, grease them, and put it all back together. With a clean gear box my Roomba runs like new. The point of this story is - add gear box cleaning every 4-6 months to the list of maintenance. The Neato robot seems to have good reviews and some Roomba owners say they prefer Neato over Roomba. My sister-in-law has a Neato and she is very pleased with it. At the forum that I mentioned above, robotreviews.com/chat/, you can read about Neato and other robot brands. Be certain to note the flaws of each robot. Neato, as of this writing, has a bad flaw. While noting flaws, remember that a robot vacuum should be a repairable item- to make an important distinction here -- the robot should be repairable by the owner. Things that break or go wrong should be easily remedied with affordable spare parts or a good cleaning. A "bad" flaw is one that you cannot fix and requires the unit be mailed to the manufacturer. That's bad, bad, bad. I have a Scooba, the big one, not the tiny one. It is a robot that "mops." It sprays clean water as moves across your floor, and during the process, it picks up the dirty water. It has a brush and squeegees on the bottom. It does a nice job on floors that do not have deep grout. It does better on smooth tile versus tile that has dips. I have both kinds of tile. Scooba has no issues at all with linoleum. It is for use on sealed floors only. That means that I will not use Scooba on my wood floors because the planks are separated in places and the water could get down into the unsealed wood. 1. Put Scooba back on the damp floor and press the clean button twice. 2. Add a little more water and solution to the clean tank and place Scooba in another, smaller, location to clean. The dirt dog is a "shop sweeper" and not a vacuum cleaner. I have one and use it to sweep my carport and patio. While it sweeps up dirt and small rubble easily, leaves will wrap around its brush, so it's not for picking up leaves! Like the other iRobot products, the Dirt Dog has cliff sensors and so it is okay to use it on a raised porch. If you have a ground level paved area such as a carport, you will need extra "virtual walls" to prevent your robot from running away from home. Batteries - Robots require special batteries and the batteries do not last forever. At some point you will have to purchase a replacement battery for your robot. Meanwhile, put your robots to use!